Sometimes, nucleophiles adding to a carbonyl do not follow the normal reactivity patterns that have been common so far. This is often the case with the addition of ylides. Ylides are compounds that are often depicted with a positive charge one one atom and a negative charge on the next atom. They are examples of zwitterions, compounds that contain both positive and negative charges within the same molecule. What distinguishes them from other zwitterions is the proximity of the opposite charges. The classic example of an ylide addition to a carbonyl is the Wittig reaction. The Wittig reaction involves the addition of a phosphorus ylide to an aldehyde or ketone. Rather than producing an alcohol, the reaction produces and alkene. The reaction is driven by formation of a phosphorus oxide "side product". This is a special case. The phosphorus-oxygen bond is strong enough to change the course of this reaction away from the normal pattern, and it isn't something you would have been able to predict based on related reactions. An ylide is an example of a molecular compound that contains both a positive and a negative formal charge on two adjacent atoms. The charges are right beside each other: in this case, there is a positive charge on the phosphorus and a negative charge on the carbon. Ylides are specific examples of zwitterions, which are molecules that contain positive and negative charges. The most common example of a zwitterion is probably an amino acid, which contains a positive ammonium ion and a negative carboxylate ion, within the same molecule. Phosphorus ylides are made one charge at a time. A phosphonium ion must first be assembled, containing the positive charge on phosphorus. This event occurs via a nucleophilic substitution reaction, in which a phosphorus nucleophile displaces a halogen from an alkyl halide. 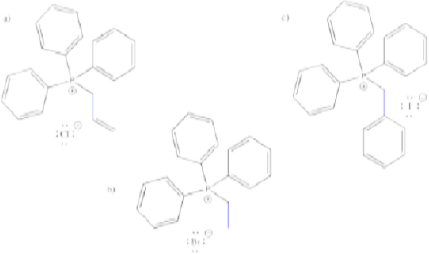 Show, with reaction arrows, formation of the three alkyltriphenyl phosphonium bromide salts shown below. In most cases, the source of the phosphorus is triphenylphosphine. Triphenylphosphine is used for several practical reasons. First of all, it is a solid, so it is easy to weigh out the right amount of it and add it to a reaction. Secondly, organophosphorus compounds are often very toxic and smelly, but triphenylphosphine is less offensive. Thirdly, in the Wittig reaction, the original phosphorus compound is eventually discarded as waste, and the more useful alkene is kept. Since the phosphorus part doesn't matter that much, the most convenient possible phosphine is generally used. However, there are other variations of this reaction that use other phosphorus compounds. Once the phosphonium salt has been made, the phosphorus ylide can then be obtained via deprotonation of a phosphonium ion. The hydrogens on a carbon next to a phosphorus cation are a little bit acidic because of the positive charge on the phosphorus. One of these hydrogens is easily removed via adddition of a very strong base such as sodium hydride. Show, with reaction arrows, formation of ylides from the three alkyltriphenyl phosphonium bromide salts shown above in Problem CO21.1. The reaction of a phosphorus ylide with a carbonyl compound does begin like other nucleophilic additions. The ylide donates its nucleophilic lone pair to the carbonyl and the carbonyl pi bond breaks. However, the strong P-O bond then takes over the reaction. To begin, a lone pair on the resulting alkoxide ion is donated to the positively charged phosphonium ion. Wait! That violates one of our mechanistic rules. Usually, we don't have an atom donate to a positively charged atom that already has an octet; if we do so, the atom will have too many electrons. However, the octet rule doesn't strictly apply to sulfur and phosphorus. These atoms are larger than second-row atoms like nitrogen and oxygen, and they are often observed to "exceed the octet rule". Sulfur and phosphorus are frequently observed with trigonal bipyramidal or octahedral molecular geometries, meaning they may have up to 12 electrons in their valence shells. So go ahead! Donate a pair of electrons to the phosphorus. It can't help itself, because of the strength of the P-O bond that forms. This is when things really get interesting. It turns out that one P-O bond just isn't enough. The phosphorus is so oxophilic that it takes the oxygen atom all to itself, pulling it right out of the molecule. It probably doesn't hurt that the four-membered ring is pretty strained, so it is motivated to decompose (but be careful: there are plenty of stable four- and even three-membered rings in nature). The arrows shown in the decomposition of the four-membered ring (called a betaine) are just meant to keep track of electrons; there isn't a true nucleophile and electrophile in this step. Instead this step may resemble a pericyclic reaction, which is covered in another section. Exactly how to draw the P=O bond is debatable. There isn't much doubt that it is a double bond; it is stronger and shorter than a P-O single bond. However, quantum mechanical calculations indicate that the phosphorus can't form a pi bond. This double bond is different than other double bonds you have seen. For that reason, some people prefer to draw this compound as an ylide, too, with a positive charge on the phosphorus, a single bond, and a negative charge on the oxygen. The phosphorus oxide compound forms, leaving behind an alkene. Alkenes are very common in nature, and this reaction has frequently been used to make interesting alkene-containing compounds for further use or study. The juvenile hormone of the cecropia moth caterpillar (JH-1, below) is a regulatory hormone used to control the organism's development by preventing it from pupating until conditions are right. Synthesis of insect hormones is often undertaken in order to control insect populations. The following synthesis of JH-1 was developed by Barry Trost (Stanford) in the 1960's. Fill in the missing reagents and reaction products. Sulfur ylides are also good nucleophiles for aldehydes and ketones. However, the unusual stability of the phosphorus-oxygen bond does not have a similar analogue in sulfur chemistry. Sulfur ylides are formed in a manner very similar to phosphorus ylides. Show, with arrows, the mechanism for formation of the sulfur ylide above. Once formed, sulfur ylides react with aldehydes or ketones. Like phosphorus ylides, the reaction starts out just like any other nucleophile, but a second step takes a very different direction. Epoxides are formed in these reactions, and the original sulfur compound (a thioether) is regenerated. Show, with arrows, the mechanism for the epoxide-forming reaction above. Fill in the product or reagent for each of the following transformations. Remember there is always an acidic workup assumed. Identify the starting material as nucleophile or electrophile in the following reactions (from the synthesis of an epothilone analogue by K.H. Altmann at ETH). In the product, box the part of the structure that came from the compound on the left; circle the new part. Fill in the blanks in the following synthesis. Requires knowledge of aldol addition, Grignard additions, and Wittig / Horner-Wadsworth-Emmons reactions. Altmann's epothilone analogue synthesized above (shown on the right, below) clearly bears some resemblance to natural epothilone A (below, left). However, the analogue is effective at much lower concentrations than the natural product. That information may actually reveal something about how the natural product interacts with its target. a) Parts of the epothilone A are highlighted. Circle and box the corresponding parts of the analog. b) Describe the differences between the highlighted portions of the natural and synthetic versions. One could imagine the boxed alcohol group forming part of a pharmacophore -- the part of the compound that binds with its target. c) What intermolecular attractions seem likely with this group? d) Comment on the apparent importance of this group in binding to the target, based on the evidence. One could imagine the circled part of the natural compound adopting different conformations via changes in the dihedral angle. e) What dihedral angle appears to be shown in the natural epothilone? f) What dihedral angle appears to be shown in the analogue? g) Based on the evidence, which dihedral angle is preferred in order to bind to the target?